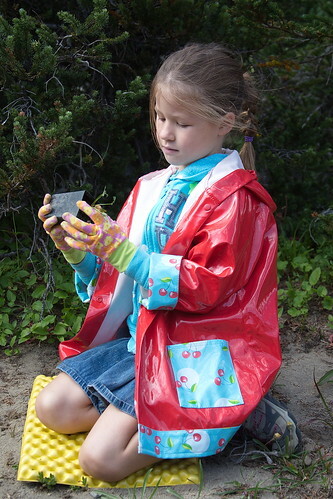 National Public Lands Day 2011, a photo by The Bacher Family on Flickr. 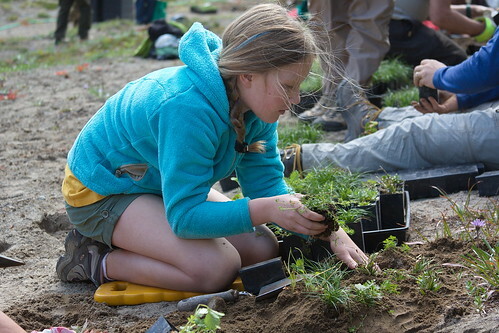 For National Public Lands Day this year, more than a hundred volunteers showed up to help maintain trails and restore meadows at Mount Rainier National Park. Elizabeth, a young woman from Snoqualmie, showed up with her family and hiked a mile out from Sunrise to the old Sunrise drive-in campground, now being restored to its natural state. It was cloudy and breezy, and I love the way her hair blows around her face as she concentrates on her task. Thank you to all the volunteers who contributed their time in service to their National Park! Below, Elizabeth's sister Clara prepares a plant for planting.